دهقانی محمدآبادی, محسن, جلالی نائینی, سید حمید. (1395). حل تقریبی سرعت لازم در مدل زمین بیضی گون با فرض شتاب گرانش تکه ای خطی. علوم و فناوری فضایی, 9(3), 1-12. محسن دهقانی محمدآبادی; سید حمید جلالی نائینی. "حل تقریبی سرعت لازم در مدل زمین بیضی گون با فرض شتاب گرانش تکه ای خطی". علوم و فناوری فضایی, 9, 3, 1395, 1-12. دهقانی محمدآبادی, محسن, جلالی نائینی, سید حمید. (1395). 'حل تقریبی سرعت لازم در مدل زمین بیضی گون با فرض شتاب گرانش تکه ای خطی', علوم و فناوری فضایی, 9(3), pp. 1-12. دهقانی محمدآبادی, محسن, جلالی نائینی, سید حمید. حل تقریبی سرعت لازم در مدل زمین بیضی گون با فرض شتاب گرانش تکه ای خطی. علوم و فناوری فضایی, 1395; 9(3): 1-12. در این مقاله، حل تقریبی سرعت لازم با قید بردار موقعیت نهایی در مدل زمین بیض یگون با استفاده از فرض شتاب گرانش تک های خطی ارائه شد ه است. 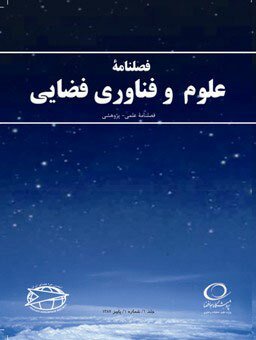 در این روش، زمان پرواز به چند بازة زمانی تقسیم و شتاب گرانش در هر بازه به صورت خطی تقریب زده م یشود. این روش حل به یک رابطة صریح سهبعدی برحسب بردار موقعیت کنونی، بردار موقعیت نهایی مطلوب و زمان پرواز منجر خواهد شد. دقت و بار محاسباتی روش یادشده به ازای تعداد باز ههای مختلف با استفاده از حل عددی مسئله به دست آمده و با دو روش تکرارپذیر زارچان و خط یسازی مقایسه شده است. این روش در مقایسه با دو روش یادشده، به ازای بار محاسباتی نسبتاً یکسان، در مدل زمین بیض یگون و مدار حداقل انرژی تا زاویة برد 18 درجه دقت بیشتری دارد. به علاوه، روش ارائه شده برای مسئلة دو یا چند جسم و محاسبة ماتریس حساسیت سرعت لازم قابل استفاده است. In this paper, an approximate solution of required velocity with final position constraint is derived using a piecewise linear gravity assumption for elliptical earth model. In this approach, the total flight time is divided into several time intervals and the gravitational acceleration is assumed to be linear at each interval. The solution gives an explicit relation in terms of the current position vector, desired final position and flight time in three dimensions. The accuracy and computational burden of the method are obtained numerically in terms of the number of time intervals, and compared with linearized solution and Zarchan's iterative algorithm. Numerical solution shows that the present method has better accuracy than the two mentioned approaches with the same computational burden up to a range angle of 18 deg for minimum energy trajectory in an elliptical earth model. The presented method can be extended for two or multi-body problem and also for the computation of sensitivity matrix of required velocity. Pitman, G.R., Inertial Guidance, John Wiley & Sons Inc., New York, 1962. Battin, R.H., An Introduction to the Mathematics and Methods of Astrodynamics, Revised Edition, AIAA Education Series, USA, 1999. Siouris, G.M., Missile Guidance and Control Systems, Springer-Verlag Inc., New York, 2004. Battin, R.H., “Space Guidance Evolution- A Personal Narrative,” Journal of Guidance, Control, and Dynamics, Vol. 5, No. 2, 1982, pp. 97-110. Battin, R.H., “Lambert's Problem Revisited,” AIAA Journal, Vol. 15, No. 5, 1977, pp. 707-713. Battin, R.H. and Vaughan, R.M., “An Elegant Lambert Algorithm,” Journal of Guidance, Control, and Dynamics, Vol. 7, No. 6, 1984, pp. 662-670. Avanzini, G., “A Simple Lambert Algorithm,” Journal of Guidance, Control, and Dynamics, Vol. 31, No. 6, 2008, pp. 1587-1594. Roshanian, J., “A Numerical Solution for Lambert's Problem,” Proceeding of the 24th Tsalkovski Conference, Kaloug, Russia 1998. Leeghim, H., and Jaroux, B.A., “Energy-Optimal Solution to the Lambert Problem,” Journal of Guidance, Control, and Dynamics, Vol. 33, No. 3, 2010, pp 1008-1010. Leeghim, H., Kim, D. and Turner, J., “Solution for Nonlinear Three-Dimensional Intercept Problem with Minimum Energy,” Mathematical Problems in Engineering, Article ID 435725, 2013. Zarchan, P., Tactical and Strategic Missile Guidance, 6th ed., Progress in Astronautics and Aeronautics, Vol. 239, AIAA, Reston, VA, 2012. Ahn, J. and Lee, S., “Lambert Algorithm Using Analytic Gradients,” Journal of Guidance, Control, and Dynamics, Vol. 36, No. 6, 2013, pp. 1751-1761. Ahn, J., Bang, J.P. and Lee, S., “Acceleration of Zero-Revolution Lambert’s Algorithms Using Table-Based Initialization,” Journal of Guidance, Control, and Dynamics, Vol. 38, No. 2, 2015, pp 335-342. Newman, B., “Strategic Intercept Midcourse Guidance Using Modified Zero Effort Miss Steering,” Journal of Guidance, Control, and Dynamics, Vol. 19, No. 1, 1996, pp. 107-112. Liwei, Z., Wuxing, J. and Jianying, Z., “Zero Effort Miss Formulation for Longer Range Targeting,” Proceedings of the 26th Chinese Control Conference, Zhangjiajie, Hunan, China, July 26-31, 2007, pp. 414-417. Deihoul, A.R. and Massoumnia, M.A., “A Near Optimal Midcourse Guidance Law Based on Spherical Gravity,” Scientia Iranica, Vol. 10, No. 4, October 2003, pp. 436-442. Liwei, Z. and Wuxing, J., “A Near Optimal Midcourse Guidance Law for Exoatmospheric Interceptor,” Proceedings of the 26th Chinese Control Conference, Zhangjiajie, Hunan, China, July 26-31, 2007, pp. 502-506. Deihoul, A.R., Anti Ballistic Optimal Midcourse Guidance Law, (PhD Thesis), Sharif University of Technology, Tehran, Iran, 2003. Ramos, J.I., “Piecewise-Linearized Methods for Initial-Value Problems with Oscillating Solutions,” Elsevier Applied Mathematics and Computation, Vol. 181, 2006, pp. 123-146. Ramos, J.I., “Determination of Periodic Orbits of Nonlinear Oscillators by Means of Piecewise-Linearization Methods,” Chaos Solitions & Fractals, Vol. 28, 2006, PP. 1306-1313. Hull, D.G., and Nowak, M.J., “Neighboring Suboptimal Control for Vehicle Guidance,” AAS/AIAA Space Flight Conference, N93-2201, Pasadena, 1993. Bolender, M.A., Doman, D.B., and Oppenheimer, M.W., “Application of Piecewise Linear Control Allocation to Reusable Launch Vehicle Guidance and Control,” The 14th Mediterranean Conference on Control and Automation, 2006. Jalali-Naini, S.H., “Approximate Solution of Sensitivity Matrix of Required Velocity Using Piecewise Linear Gravity Assumption,” Journal of Aerospace Science and Technology, Iranian Aerospace Society, Vol. 9, No. 2, Fall 2012, pp. 25-32. Ueberhuber, C.W., Numerical Computation 1: Methods, Software, and Analysis, Springer Science & Business Media, 2012. Valpiani, J.M., and Palmer, P.L., “Nonlinear Geometric Estimation for Satellite Attitude,” Journal of Guidance, Control, and Dynamics, Vol. 31, No. 4, 2008, pp. 835-848.